AT&T’s shameless strategy to deny us fair wages and benefits is backfiring. A large investment advisory firm, whose clients hold millions of AT&T shares, recently sent AT&T’s leadership a letter that essentially demanded they stop playing games with us. The firm correctly pointed out that it’s not in AT&T’s long term best interests to alienate its labor force by trying to cut back critical health benefits and job security protections. We couldn’t agree more. If AT&T’s leaders don’t come to their senses on their own, we’ve got plenty of upcoming actions that will force them to negotiate in good faith. On April 26, we’re mobilizing across California and Nevada. We’re counting on our locals to drive turnout for this, so please contact your local union office for details on how you can get involved. We need all hands-on deck. We’re planning over 20 rallies outside AT&T stores. Each local will be responsible for protesting outside an AT&T store in their area, and we’re calling on each Local to turn out large numbers of their membership. Also, on this same day our CWA legislative and political activists will be bring our message to the halls California’s State Capitol. Two days later, on April 28, when AT&T shareholders will gather in Dallas for the company’s annual shareholders meeting, they’ll be greeted with a swarm of our flyers making AT&T shareholders acutely aware of our issues this round of negotiations and its potential impact on the Company’s future. 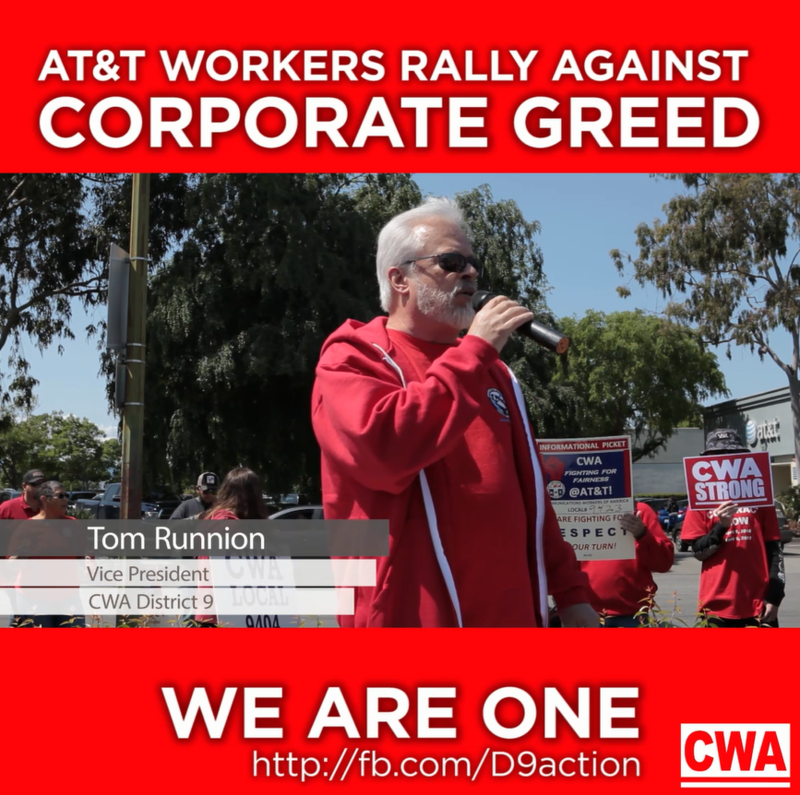 And, if AT&T’s disrespect continues, a strike is still on the table. We’ll share much more on these upcoming plans as the dates draw closer. Stay tuned. It’s been a tough fight, but we’re all in this struggle together. Get motivated to keep fighting for a fair contract by watching this video featuring District 9 Vice President Tom Runnion. And ICYMI: Take a few minutes to watch our recent bargaining video. We cover each contract item that we’re currently disputing with AT&T and why.